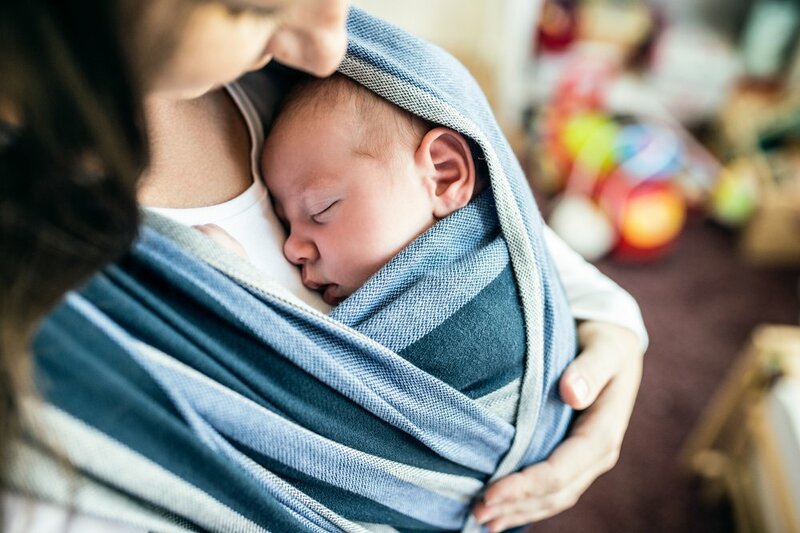 Chances are you’ve come across the terms babywearing, baby carrier, or baby wrap, as these seem to have taken over social-media feeds, parenting blogs, and even newborn’s fashion. Along with this surge in its popularity, important questions can arise around babywearing, such as “what does babywearing refer to?”, “how do I use a baby carrier?”, “are baby wraps safe?”, among others. Don’t worry, in today’s blog entry we’re going to guide you through some of the “whys” and the “hows” of babywearing so that you can better decide whether or not it’s something you want to try. According to the NGO Babywear International, babywearing refers to the practice of using a baby carrier to keep your baby close to your body while you engage in your everyday activities. This method of transporting your baby as you go about the day has been the norm for many native cultures of Mexico, Peru, Indonesia, etc., and has proven to be a safe and effective tool for many caregivers throughout the centuries. Today there is a wide array of baby carriers available, so you can find one to cater to every budget and taste. Let’s have a look at why babywearing may be so appealing nowadays, and note some important considerations about its implementation. Conveys a sense of bonding similar to that of cradling your baby in your arms, but without compromising your mobility (ex. it allows for a stroller-free and hands-free walk in the park). The closeness incites engagement and attunement between the caregiver and the baby, thus creating a cycle of positive interaction between them. Provides skin-to-skin contact, which has been found to help regulate the baby’s body temperature, as well as lower cortisol-blood levels in both the infant and the mother. Allows your infant to be involved in social interactions without leaving the comfort of your side. Contrary to stationary plastic carriers, babywearing lets you include your baby in your daily activities, so it can ease the process of increasingly engaging more with work or chores like grocery shopping. Promotes a secure attachment as well as pleasant feelings. A study published in Pediatrics found that when compared to the usual practice of using an infant carrier, babywearing for 3 hours a day reduced overall baby-crying by 43%. Supports taking care of other siblings. Babywearing can help you attend to older children without worrying about leaving your infant distressed by sudden shifts in attention. Make sure that your baby’s airway remains open and visible at all times. Choose a carrier that provides support for your baby’s developing neck, back, and pelvis (ergonomic carriers, like a soft structured one, are good options). Comfort and confidence are keys. Inspect your carrier for wear or damage before each use. Avoid babywearing in those situations where it wouldn’t be safe to carry a baby in-arms. If you have more specific questions or personal concerns about babywearing, we invite you to talk to your medical professional about them.